Blockchain technology was presented in a 2008 paper by Satoshi Nakamoto as a decentralized, cryptographically empowered currency framework for financial transactions without an intermediary. Digital currency, obviously, was not a new idea, but Nakamoto's paper offered a solution for the "double spending" problem, which is how to prevent a person from replicating their digital currency and spending it multiple times? The blockchain was a solution that came with the most popular digital currency - Bitcoin. Fundamentally, the blockchain is a shared database but with one key difference. As opposed to a traditional database, there is no central ownership. Instead, information is managed through the consensus of network members who work together (with the assistance of cryptography) to choose what gets included in the database (blockchain). 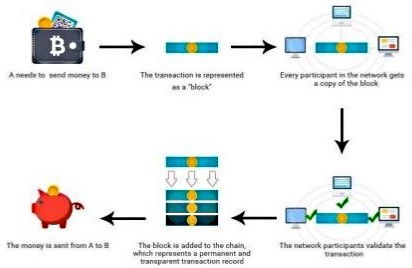 Every member keeps an identical, full copy of all transactions ever made in the network to ensure that no duplicate transactions are entered into the database. The network can be public (like Bitcoin, open to anybody) or private (allowed only for certain individuals). When new data needs to be added, every machine on the network is notified and updates its copy of the blockchain accordingly. The outcome is a far-reaching and decentralized source of trust - formed through cryptographically-aided consensus. The data stored can be anything, such as financial transactions, personal identities, land titles, intellectual property, even "smart contracts." Special computer codes are executed when certain conditions are met. Still, blockchain technology's most important trait is its immutability. Once something has been placed on the blockchain, it becomes permanent - spread across many computers, cryptographically secured and added to the history of transactions. Image 1. Graphical Representation Explaining How Blockchain Technology Works. Various blockchain configurations utilize different consensus mechanisms, depending on the type and size of the network and the goal of a company. The Bitcoin blockchain, for example, is public and "permissionless," which means that anyone can participate and add blocks to the ledger. Many companies are exploring private or "permissioned" blockchains with networks consisting only of known participants. This is also the case with most health care projects. Each of these blockchain implementations works in a different way. A blockchain's network can involve everyone with a computer. Each computer in a network is called a node. If everything is correct, each node should have a copy of the entire ledger (sort of a local database) and works with other nodes to keep the ledger's consistency. This creates fault tolerance, so if one node disconnects or goes down, no data is lost. The consensus mechanism is a set of rules the network utilizes to verify each transaction and confirm on the current state of the blockchain. In the Ethereum blockchain, which is used for development of many projects in industry, the consensus mechanism is called proof of work, in which participants on the network run algorithms to confirm the digital signatures attached to blocks and verify each transaction. After a transaction is executed on a node, the result becomes a proposed modification of the blockchain's data. Before sending the answers to a node's ledger, the answer is confirmed locally with other nodes in the network. Approved transactions are placed into a block and re-distributed to all the nodes in the network, which verify it again to ensure their records match. Typical transactions can be executed in milliseconds. "If I had only invested in Bitcoin when it was just a tiny, cheap little experiment..." Did you ever have this thought? If so, then you're not alone. Bad News: This opportunity has passed. Good News: Others are right in front of you. 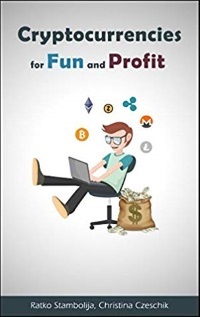 In the case of Bitcoin, investment opportunities became more sophisticated and accessible o the non-expert user. And then, there are the so-called altcoins, which are alternative cryptocurrencies other than Bitcoin, such as Ethereum, Ripple and Steem. Altcoins may not be in the news quite as often, but they have made many an investor happy. How do you get started with cryptocurrencies? That's what you'll learn in this book.